The E/e gene controls whether the basic color on the rabbit (black, blue, chocolate, or lilac) is extended all of the way to the end of the hair shaft or whether the basic color stops and another finishes the hair shaft (such as the orange color on the back of a black tortoiseshell). When a rabbit has full extension, it tends to look the same color all over, such as with a blue rabbit. When there is non-extension, such as with a black tortoiseshell, the rabbit takes on a shaded look since the shorter hairs on the belly, guard hairs, feet and muzzle get only the basic color (they are not long enough to get the other color that finishes off the longer hairs). That all sounds simple enough, but there is a complication. Some C-series genes can also give a shaded look for a different reason (check out the sable gene, for example). These babies, black and tortoise, are genetically the same, except the blacks are E_ and the torts are ee. the extension gene that has a surprising twist. Usually the gene that is found in nature is the dominant variety. But with the steel gene, it is actually dominant over the “E” full extension gene found in nature. You need only look for steeling in full-extension animals: black, blue, chocolate, lilac, etc. It will never show up in “e-e” rabbits: black tortoiseshell, chocolate tortoiseshell, blue tortoiseshell, etc. 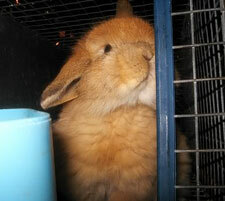 Non-extension colors have the "e" gene, and are yellowish in appearance, like a tortoise or this orange American Fuzzy Lop. Let’s look at what happens when we breed a full extension rabbit that carries the non-extension gene with a steel-tipped rabbit carrying the non-extension gene (E-e x Es-e). Since it only takes one Es gene to make a rabbit steel-tipped, 1/2 of the offspring, on the average, will be steel-tipped. The other half is split between the full extension (carries non-extension) and the non-extension varieties. Let’s look at breeding two steel-tipped rabbits together. The parent rabbits in the case each carry a non-extension gene. Remember, as noted above, a rabbit with two steel genes may not show the steel-tipping. Even though 1/4 of the resulting offspring, on the average, will have two steel genes, they may not show it. Half of the offspring will have and be able to show the steel-tipping, while the remaining 1/4 will not have steel-tipping at all (remember, steel-tipping is only found in full-extension rabbits). The situation above is a very interesting one. If we know that both parents are steel-tipped and we find that one or more of the offspring is non-extension (meaning each parent must have an “e” gene to donate to the offspring), then we can be certain that all of the full-extension offspring are steel, whether they show it or not. Let’s take the Es-Es offspring and see how the steel-tipping can suddenly seem to spring up from nowhere. We’ll breed it with a true-breeding full extension rabbit (E-E) and see the steel-tipping showing up in 100% of the offspring. Breeding two of these Es-E offspring back together will produce 1/4 double steel genes that may not express themselves, 1/2 steel-tipped, and 1/4 full extension rabbits. Since these are chances (25% chance) rather than definite outcomes, you could produce only the Es-Es rabbits in a litter (especially in a small litter) giving the appearance of a generation-skipping gene. In fact, the Es gene could be hidden this way for two or more generations, giving the impression of “popping out of nowhere.” Let’s look at the two Es-E rabbits’ possible outcomes. 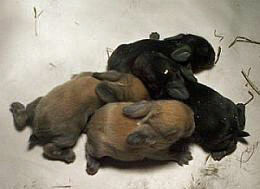 Of course, not all, and perhaps relatively few, Holland Lop breedings involve the steel gene. Let’s look at two full extension rabbits that carry the non-extension gene. Notice that the two full extension rabbits can produce approximately 25% non-extension offspring. This situation is what we have when, for example, we breed two black rabbits together and get a resulting black tortoiseshell kit. The Es gene is dominant over the E gene, which is fairly unusual. Two E’s genes together can hide the steeling effect, making the steel gene seem to pop out of nowhere. Steel-tipping can only be found in, and carried by, full extension colored rabbits. It cannot be carried by a tort, for example. Colors such as black and black tortoiseshell (tort) are related since they only vary by the e-series gene. Using your knowledge of how these genes are related can help you in breeding for certain colors and for determining rabbits colors as well. [Editor’s note: The five E-series genes in order are Ed, Es, E, ej, and e. The above only covers three in much detail, so here’s a quick summary of the other two. Ed — Dominant Black or Dark Extension s actually the most dominant E series gene. This takes the dark pigment extension way beyond the normal agouti pattern, so a chestnut with the Ed gene will look black. The “blacks” caused by this gene are a very deep color and are less likely to have scattered white hairs than a true black. Things may change someday, but for now, Ed is rarely found so it’s best to assume your blacks are true selfs unless they meaninglessly throw agoutis when bred to a true self. Steel is a lesser version of Ed. Es carries the dark pigment most of the way up the hair shaft, but leaves a little light color at the tip of the guard hairs. This produces the steel variety ONLY when coupled with the agouti gene. ej — The ‘j’ stands for Japanese brindling”. When you see ej think “harlequin” or “tricolored”. (Japanese was the original name for harlequin and is still the name of a color group in the harlequin breed.) The ej gene creates the color groups Japanese, magpie, and tri-colored. 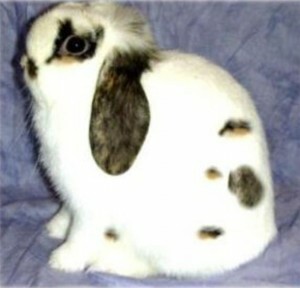 When a rabbit has a harlequin genotype but not clear harlie markings, this is called brindle. In technical terms, the ej gene segregates the dark brown and yellow pigments, putting them on separate hair shafts. The ej gene only works properly on rabbits that have the agouti gene.